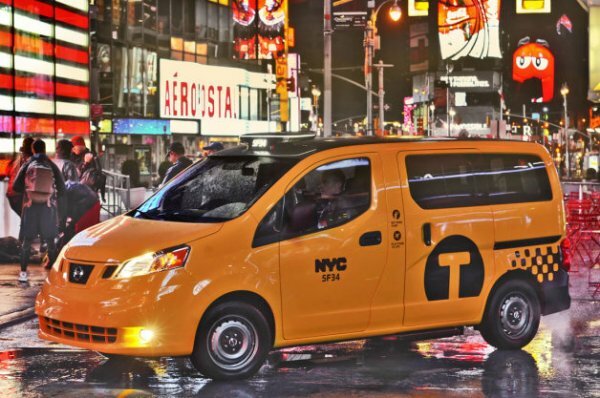 After years of collaboration on design and development, the Nissan NV200 Taxi of Tomorrow begins sales to cabbies in New York City, despite the attempted mandate by the city commission being destroyed by a Supreme Court judge. Deliveries of the NV200 Taxi of Tomorrow began last week, with pre-order sales being fulfilled and showrooms at commercial dealers beginning to see the yellow Nissan vans on their floors. The taxis were built in a collaboration between Nissan and the New York City Taxi and Limousine Commission with the final production prototype being showcased at this year's New York Auto Show. The taxis, which feature several custom enhancements for the commercial passenger market, are painted in the signature New York Taxi yellow and are built in Nissan's commercial vehicle plant in Mexico. Originally, the Commission had planned to mandate that all 15,000 of the city's cabs be switched over to the NV200 Taxis within a few years, but that mandate was challenged on constitutional grounds and the challenge was upheld by a New York State Supreme Court judge. This means that while the taxi won't be mandated, it will still be considered the go-to vehicle for the taxi drivers of NYC. That judge's decision was made just a week before the taxis began arriving in New York for sale. Justice Shlomo Hagler said that the city had overstepped itself in attempting the mandate and that independent owners, operators and companies should be free to choose their own vehicles under law. The city is appealing that decision, but is not likely to get a decision before the end of the year. At that time, controversial Mayor Michael Bloomberg will see his term end and neither of the leading candidates for mayor are in favor of the mandate and would likely overturn or rescind it once in office. For Nissan, the mandate was not an important part of the taxi's development. The automaker plans to sell the Taxi of Tomorrow in global markets and has already begun sales in Europe. "The New York City Metro Area is an important market for the NV200 Taxi of Tomorrow," said a Nissan spokesperson to TorqueNews. "We are confident in our product. When taxi drivers have test driven it, they've been impressed by the NV200 Taxi of Tomorrow's capability and appeal."